Your eyes ... Your ears ... Your senses ... Will be overwhelmed. 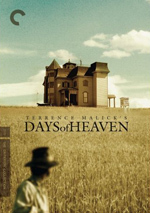 One-of-a-kind filmmaker-philospher Terrence Malick has created some of the most visually arresting movies of the twentieth century, and his glorious period tragedy Days of Heaven, featuring Oscar-winning cinematography by Nestor Almendros, stands out among them. In 1910, a Chicago steel worker (Richard Gere) accidentally kills his supervisor and flees to the Texas panhandle with his girlfriend (Brooke Adams) and little sister (Linda Manz) to work harvesting wheat in the fields of a stoic farmer (Sam Shepard). A love triangle, a swarm of locusts, a hellish fire-Malick captures it all with dreamlike authenticity, creating at once a timeless American idyll and a gritty evocation of turn-of-the-century labor. Back in the Seventies, Terrence Malick was a regular workhorse – in relative terms. He debuted with 1973’s Badlands and then came back with 1978’s Days of Heaven. 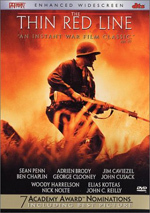 After that, Malick took a 20-year break before he returned with 1998’s The Thin Red Line. Compared to that long layoff, the seven years between Line and 2005’s The New World seems like the blink of an eye. Set in the early part of the 20th century, Heaven introduces us to Bill (Richard Gere), his lover Abby (Brooke Adams) and his young sister Linda (Linda Manz). When he assaults a supervisor at his job, he flees. The trio end up on a spread where they work for a farmer (Sam Shepard). Bill tells everyone that he and Abby are brother and sister, which makes their touchy-feely behavior look suspicious. Nonetheless, this seems to leave open the door for others to woo Abby, and the farmer sets his eye on her. This creates a dilemma because Bill overhears that the farmer has a terminal illness. If Abby marries him and sticks out the relationship for that period of time, she and Bill can take over the farm when the farmer croaks. The movie follows this unconventional love triangle and its complications. Malick seems destined to always be one of those “love him or hate him” directors. His non-linear, ambling cinematic style enchants some and completely turns off others. Either you buy into his unconventional ways or you want little to do with his work. Days is the third of Malick’s four films that I’ve seen. My first experience came with Thin Red Line, and it wasn’t pretty. I found its slow, languid pacing to make it nearly intolerable. It went on forever but nothing much ever happened. That made The New World more of a surprise when I turned out to actually like it. While it still engaged in Malick’s signature dreamy visual lushness, it told an actual story, and the visual presentation made more sense for the tale. So I hated one Malick flick and rather enjoyed another. I hoped that Days would break the tie in favor of the “good Malick”, but alas, it reminds me more of Thin Red Line than New World. Actually, that’s not wholly fair, as I think the visual style makes more sense here than it did in Line. To a degree, at least, as at times I feel the lush visuals subvert the tale. We watch poor, desperate characters as they struggle to survive, but everything looks so beautiful that we start to wonder why they’re so down. We wonder a lot about them, really, as the film doesn’t tell us much. I don’t want tons of plodding, obvious exposition in a movie, but I’d like a little more character depth than what we find here. The various personalities lack much substance, as we learn little about them and never get a good feel for any of them. They mostly exist as mannequins to move along the minimal plot and to look good in front of the lush scenery. Indeed, Days doesn’t have a plot as much as it has plot devices. Why do Bill and Abby claim to be brother and sister? The movie never really explains this and it doesn’t make much sense other than as a concept to prompt story elements. If everyone knows that Bill and Abby are a couple then there’s not much of a tale to tell since the farmer wouldn’t have seen Abby as available. Speaking of plot devices, I could live without Linda’s narration. Part of that’s because I don’t much like narration in general. Films usually use this as a cheap device to flesh out sketchy details. The narration here feels awkward and clumsy, and Manz’s unpleasant voice doesn’t help. She’s a fairly annoying presence. Also, doesn’t it seem like a bad choice to make the farmer young and handsome? I think that’d make Bill and Abby’s scam seem like more of a sacrifice. I doubt many women in the audience think that Abby suffers a big loss in the move from Richard Gere to Sam Shepard. With an older actor as the farmer, the part would make more sense and that theme would better succeed. Like most Malick works, Days cares more about how it looks than what it says. Not exactly concerned with narrative, it focuses on tone and visuals. That makes it maddeningly meandering at times, especially during the first half. Most of the film rambles along without much rhyme or reason. It paints a lovely picture but never delivers much substance. And that’s the main problem I have with Days - and with Malice as a filmmaker, I guess. He’s a visual artist who doesn’t seem to care about story, characters or much else. That clearly works for some, as many view Malick as a genius. In the case of Days, I think he displays an excellent eye for visuals but creates a tedious movie. Why it pays to watch the end credits: for reasons I can’t fathom, Redd Foxx gets a “special thanks” message here! Terrence Malick and Fred Sanford – there’s an odd couple for you. 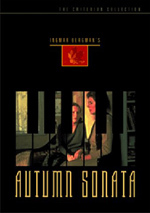 Days of Heaven appears in an aspect ratio of approximately 1.78:1 on this single-sided, double-layered DVD; the image has been enhanced for 16X9 televisions. Though a few issues cropped up, the movie usually looked good. Sharpness took some minor hits. I noticed light edge haloes through the film, and those could make wide shots a bit soft. Otherwise this was an accurate, well-defined presentation. No issues with jagged edges or shimmering occurred, and only small instances of source defects occurred. A couple of specks showed up but otherwise the flick stayed clean. The lush palette of Days came across well here. The movie gave the colors a subdued but natural look that seemed lovely throughout the flick. Indeed, the hues became a highlight of the transfer. Blacks were reasonably deep and firm, but shadows could be a bit dense. Some nighttime shots were the biggest offenders, as they seemed somewhat thick. Overall, however, the movie seemed quite attractive. Days came with a “new” Dolby Digital 5.1 track. Since Criterion prefers to go with the original soundtracks for its releases, the presence of the 5.1 mix surprised me. At least it offered a pleasant surprise, as the audio was above average for its era. The soundfield provided a rather engaging setting. A few loud scenes like the opening sequence in the factory and shots of big farm vehicles created the best material. These used the front channels in a broad, vivid manner and also spread to the rears with useful reinforcement. Other segments weren’t quite as strong, and at times the mix became essentially monaural. Still, most of the flick provided good spread to the material and opened up things well. Audio quality was generally positive. Some of the effects became a little distorted, and high-end could be slightly rough. However, those elements usually seemed solid, and bass response was very good; the low-end of the louder bits seemed really deep. Speech was acceptably natural and concise, while music appeared smooth and vivid. This was a strong soundtrack given the age of the material. As we head to the DVD’s extras, we open with an audio commentary from editor Billy Weber, art director Jack Fisk, costume designer Patricia Norris and casting director Dianne Crittenden. The first three sit together for a running, screen-specific track while Crittenden’s separate remarks get edited into the piece. The chat looks at cast and performances, sets and locations, costumes, props and period details, editing and cinematography, working with director Terrence Malick and the atmosphere on the set, and a mix of other production issues. Though the commentary starts slowly, it soon builds up a head of steam and becomes involving. The participants offer an honest appraisal of their experiences and give us a good look at the production. I must admit I feel somewhat vindicated to hear that Crittenden agrees that Sam Shepard was too young and handsome to play the farmer; that nugget alone made the experience worthwhile. But that’s not the only good moment as this becomes a generally satisfying and interesting commentary. The disc also includes a collection of interviews. First comes an audio interview with actor Richard Gere. In this 21-minute and 51-second chat, Gere goes over his career at the point Days came to him, what appealed to him about the project, the film’s visual style, cast and crew, working with Malick, his take on his character, location shooting, and some other filming specifics. Gere provides a nice look at his experiences on Days and makes this a pretty informative little conversation. Next we find three video interviews. The first comes from actor Sam Shepard and lasts 12 minutes, 33 seconds. Shepard discusses how he got cast in the film, impressions of Malick, thoughts about the era in which the flick is set, and the movie’s characters and story. Shepard throws out a few decent notes, but like Days itself, he usually waxes more philosophical than factual. Other than some info about Malick, it’s not an especially interesting chat. Visual elements dominate the final two interviews. We hear from camera operator John Bailey (20:25) and cinematographer Haskell Wexler (11:35). From Bailey, we learn about interactions on the set, the film’s visual style, sets and locations, camera, lighting and technical issues, some effects, and general thoughts about the experience. Wexler talks about coming onto the set after the departure of cinematographer Nestor Almendros and how he then worked on the film. Bailey’s chat proves to be the more useful of the two, as he gives a more nuts and bolts look at things. Wexler is less involving, but he still offers some good notes about the shoot, especially in terms of Malick’s unconventional style. Finally, the package presents a 44-page booklet. This production includes essays by Monash University senior research fellow in television and film studies Adrian Martin and Almendros as well as photos and credits. No one does booklets better than Criterion, and this is another fine compilation. Whether you’ll like Days of Heaven depends on how much you like Terrence Malick’s impressionistic filmmaking style. If you enjoy his preference for visuals over narrative, you’ll dig it. If you find that form to be frustrating and meandering – and I do – then you’ll probably not find much to enjoy here. The DVD provides good picture and audio along with a smattering of pretty informative extras. This becomes a nice release for a rambling movie.